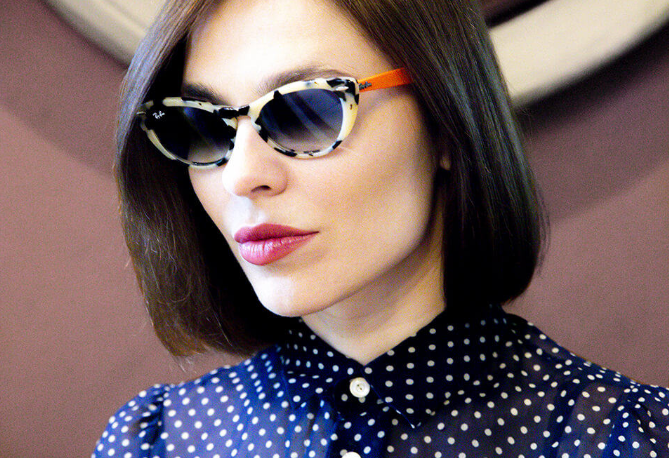 Ray-Ban is continuing to show its support for talented musicans in a new limited edition collaboration with Russian DJ Nina Kraviz. The internationally acclaimed DJ has re-invented the iconic cat-eye style from the Ray-Ban archives, first seen in the 60s. This collection, now called the “Nina,” features a tortoise-shell frame, flat lenses, and two limited edition colourways. One colourway has a light blue gradient lens and an orange temple that reflects Kraviz’s experimental style. The second has a washed yellow lens to contrast a green temple, which showcases Kraviz’s own artistic style and vintage-inspired sensibilities. Earlier this year, Ray-Ban launched Ray-Ban Studios, an initiative to celebrate self-expression and individuality. This hub is where can artists can share their stories and show us how they stay true to their inner self. The brand has had a deep-rooted music history with decades-long associations to music greats such as Bob Dylan and Ray Charles. The Ray-Ban Studios Feel Your Beat campaign showcases the brand’s support music, with its first collaboration with The Martinez Brothers in June. This new collaboration with Nina Kraviz will be the brand’s second campaign in an effort to honor the individualistic style and creativity this talented musician. These deliciously cool, vintage-inspired sunglasses are on sale now at Ray-Ban’s .